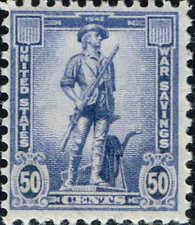 United States - Scott number R63c. Fine - Used. The o/p is similar to type 7 but the date is complete. There is one CSA Cover. US REVENUE and BACK OF BOOK COLLECTION - NICE GROUP!! US REVENUE and BACK OF BOOK COLLECTION. THIS IS A NICE GROUP! In Mint Never- Hinged/VF condition. THESE ARE LISTED IN THE STATE REVENUE CATALOG AS # B3. ADD THESE INTERESTING REVENUES TO YOUR COLLECTION. United States - RD22. Very Fine - Used. United States - R3c. Block of 15 of. One has a factory cancel; another a red 101. One orange stamp has a very fine factory cancel. U.S. Revenue Mix/60. Types of cancels include regular stamped; cut; perfin; machine & hand. (No. 17; Jan. 1919 2nd District of Va.). THIS IS LISTED IN THE STATE REVENUE CATALOG AS # W9. ADD THIS INTERESTING REVENUE TO YOUR COLLECTION. 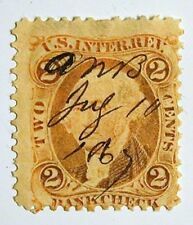 US SC# R84C LOT OF 20 INTERNAL REVENUE STAMPS 1862-1871 ISSUE VERY NICE!! This is an example of R42c with a pre printing fold on the right. The stamp is sound. CV based on 2017 SMQ Value Guide. U.S. B.O.B. Revenue Stamp - Assorted Lot of 50 used as shown 4/6 a few mint. US Internal Revenue Stock Transfer Stamps Series 1942. Shipped with USPS First Class Package. 2c, 4c, 5c, 10c, 20c, 25c, 40c, 50c, $1, and $2. Bid based on the photo, you will receive the stamps pictured. Will combine shipping @ $.55 each additional item. This is an example of R10c. The stamp has a circular date stamp and is sound. Check was written by Griffin McGrain who lined out New Albany and wrote in Corydon.